Curious as to what Ted Cruz, one of the most detestable politicians in America, is up to these days? Well, when he’s not trying to maintain his senate seat in a tight race against Democratic challenger Beto O’Rourke, he’s getting heckled out of restaurants in Washington, DC, and spotted looking at photos of his Democratic opponent on his phone. 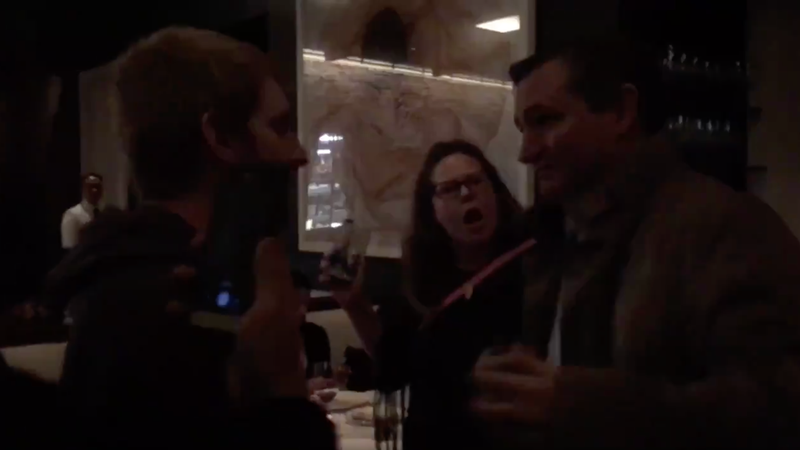 On Monday night, Cruz and his wife, Heidi, were chased out of an upscale Italian restaurant by activists shouting, “We believe survivors!” The chant was a callback to the nationwide walkout that took place earlier that day in solidarity with Christine Blasey Ford and Debbie Ramirez, two women who have accused Supreme Court nominee Brett Kavanaugh of sexual assault. Restaurant employees awkwardly tried to pry open a side door for Cruz and Heidi for a few seconds before the couple finally escaped. Next up on the docket: Cruz was caught looking at a photo of O’Rourke on his phone on a flight to Texas. Is he feeling the heat from his competition? Is he jealous of O’Rourke’s smooth skin and tiny pores? Is he self-conscious about the fact that he is only two years older than O’Rouke but looks about 20 years older because being a right wing shitbag ages you faster than cigarettes and no sunscreen? We just don’t know!